Who Won in Israel's Elections? Tzipi Livni, the head of the Kadima party, can credibly claim victory in the elections on Tuesday because her party won the most seats. Binyamin Netanyahu of the Likud party can also claim victory as the head of the largest party in the larger of the two coalitions, the national camp. 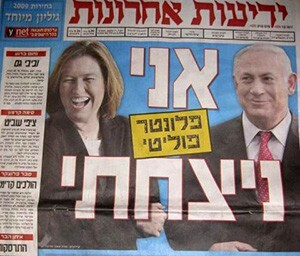 Both Livni and Netanyahu can plausibly claim "I won" the elections this week - but neither did. But the real winner was the politically and personally unpredictable figure, Avigdor Lieberman, 50, of the Yisrael Beiteinu party. A Moldovan immigrant who started his career in Likud and then served as director-general of Netanyahu's prime ministerial office, he founded Yisrael Beiteinu in 1999. Lieberman has introduced a new issue into Israeli domestic politics – the place of the country's Arab citizens. Noting their increasingly public disloyalty to the state, he has argued that they should lose their citizenship and their right to live in Israel unless they declare their loyalty to the Jewish state. This topic has clearly struck a nerve among the Israeli Jewish electorate and prompted responsible Arab voices to acknowledge that Israeli Arabs have "managed to make the Jewish public hate us." As I wrote in 2006, Israel's "final enemy" may finally, be joining the battle. The consequences of this for the Arab-Israeli conflict as a whole could well be profound. Feb. 11, 2009 update: This brief reaction to the elections, requested by National Review Online, updates a lengthier blog entry begun on January 20, 2009, "The Gaza War's Impact on Israeli Electoral Politics."